Header button label:Like us on Facebook!Like us on Facebook! 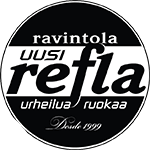 Today, Uusi Refla is familiar, particularly two things: sports and food we offer with pride. In addition, we want that you just feel at home there every day of the year. We are open 365 days a year. Ribbon button label:Order here!Order here!